Cincinnati, Ohio. 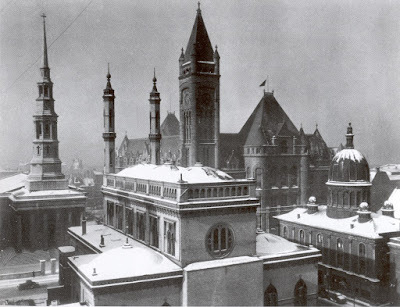 Intersection at Eighth and Plum Street, view from the east and above showing (left to right) Cathedral of St. Peter in Chains (1844), Plum Street Temple (1866), city Hall (1888 ff. ), Unitarian Church (1860s). 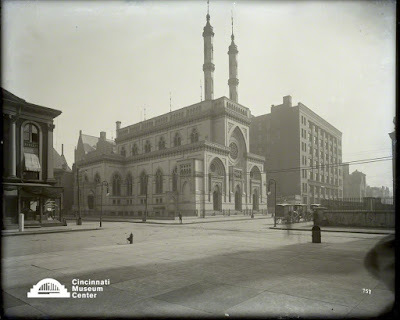 One of the most recognized and written about American synagogues is Cincinnati's Isaac M. Wise Temple (K. K. B'nai Yeshurun, commonly known as the Plum Street Temple) planned and built for Rabbi Isaac Mayer Wise and his congregation during the Civil War, and opened in 1866 (the interior was not painted until the 1870s). Wise, the founder of American Reform Judaism, was especially proud of the building which was designed by prominent Cincinnati architect James Keys Wilson and inspired by the Moorish architecture of the Iberian Alhambra. Wise was quite explicit in his admiration of the Alhambra - but he also certainly was influenced by contemporary synagogue architecture in Central Europe of which he would have heard and seen illustrations. The K. K. B'nai Yeshurun Temple, despite its prominent location at 720 Plum Street in downtown in Cincinnati, is too often regarded as a unique object, as it is represented in the oft-reproduced painting by Henry Mosler, on view at the Skirball Museum at Hebrew Union College in Cincinnati (see my photo below). Henry Mosler (1842-1920). Plum Street Temple. Oil on canvas, 1866. Skirball Museum, HUC, Cincinnati. Photo: Samuel Gruber 2017. 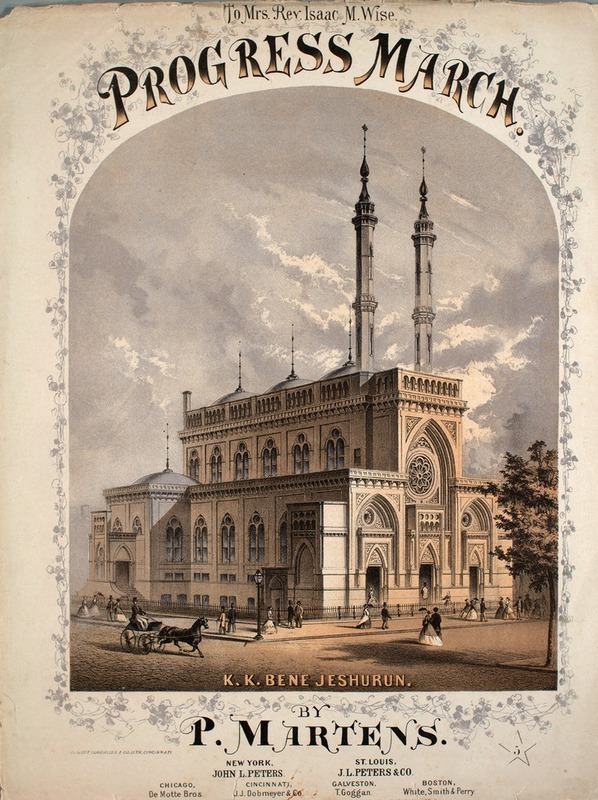 Sheet music cover for Progress March by P. Martens, with a lithograph by Ehrgott, Forbriger & Co. of the exterior of the Plum Street Temple. Published Cincinnati : J.J. Dobmeyer. Source: Low Country Digital Archive. In Mosler's and subsequent derivative images, the Temple is shown as a disembodied object. Consequently it is often studied in isolation rather than as part of a dense mid-19th century urban fabric, and as part of a growing ensemble of related religious and civic buildings. 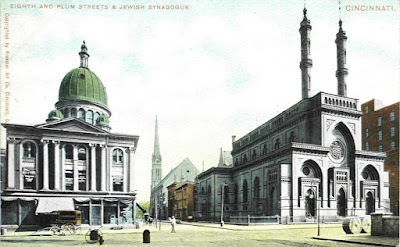 Alternatively, the Temple is written about as the first of many American Moorish-style synagogues - and thus seen retrospectively rather than in the contention of its place and time. 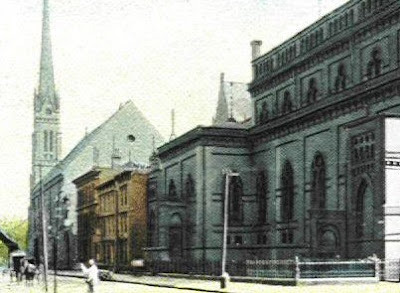 This post then is not so much about the architecture and decoration of the Plum Street Temple as a brief attempt to re-insert the building into its historic context, since the role of building in its setting can also be seen as physical manifestation of the way Rabbi Isaac Mayer Wise perceived the future of Judaism in America. The building, like Reform Judaism itself, is undoubtedly distinct and recognizable as something special, and perhaps even exotic. Still, like Reform Judaism, the Temple is built in dialog with older religious structures and is clearly intended to be part of the civic American environment. There is distinction but not separation in the architecture and siting of the Plum Street Temple. Cincinnati, Ohio. 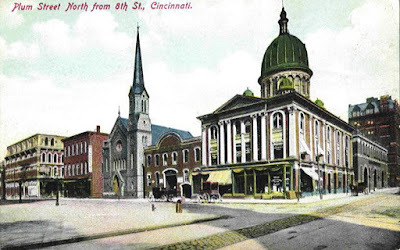 historic postcard showing the Moorish style Plum Street Temple on the right and the nearly contemporary Classical domed Unitarian church on the left, both on Plum Street at 8th Street. 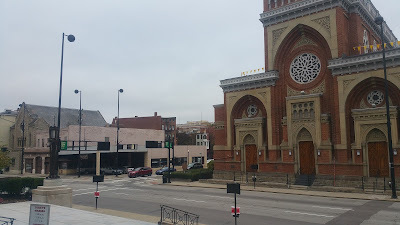 In the rear, behind several lower scale building one can see the First Presbyterian church, built in 1875 (as the Second Presbyterian Church) at 8th and Elm Streets facing Piatt Park. The same intersection today. Photo: Samuel Gruber 2017. Isaac Wise certainly viewed it in the context of the dense grouping of (often conflicting) religious and civic buildings surrounding the intersection. In October 1869 he wrote about this in a column in the Israelite (Oct 15, 1869) the national Jewish newspaper which he edited. “Religious Liberty, Corner of Eighth and Plum Streets, in Cincinnati” is typical of Wise's florid, ironic, unapologetic and polemical style. It is a valuable window into seeing the Plum Street Temple and 19th-century ascendant Reform Judaism in a broader American context where we see American Judaism both cooperative but also combatant. In the essay Wise enumerates the diversity of religious buildings and their juxtaposition with City Hall. In Wise's architectural oratory, the churches talk to each other - though not often in agreement - but this is his point, that this mix of religions and sects (and we might add, architectural styles), is the full expression of American religious liberty. "If the reader’s imagination is sufficiently vivacious, expansive and soaring to have a correct vision of said corner of Eighth and Plum Streets, he can form a correct and concrete idea of civil and religious liberty, for there is to be seen a picture to which the world at large can offer no parallel, no precedent, no comparison." Cincinnati, Ohio. 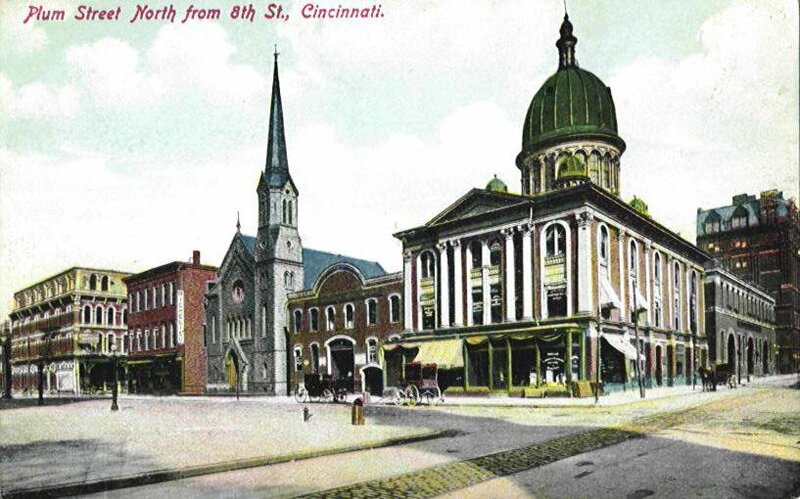 Historic postcard showing Classical domed Unitarian church on the right at Plum Street at 8th Street. Two buildings down on the left at 810 Plum Street is the First Presbyterian church, built in the 1860s, shown with its original tower. The same stretch of Plum Street today. The former Presbyterian church is now commercial space, but the building is in the Ninth Street Historic District. Photo: Samuel Gruber 2017. The same stretch of Plum Street today with a view all the way to Seventh Street. Photo: Samuel Gruber 2017. The Plum Street Temple (as some form of new synagogue) was planned from 1855, but not built until the end of the Civil War and dedicated on Friday, August 24, 1866. the Jewish Temple directly faces the older Saint Peter In Chains Cathedral, designed by Henry Walter, a masterful work of church architecture that mixes Greek Revival and the style of Christopher Wren. 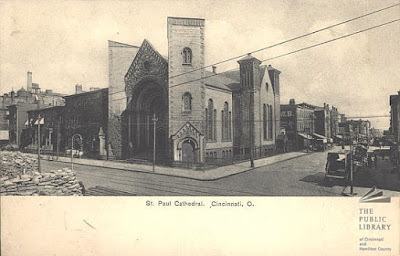 Located a half block away across 7th Street was St. Paul Episcopal Cathedral, built in 1855 and subsequently torn down in 1937. Wise begins his list of houses of worship with recognition of the Catholic Cathedral St. Peter in Chains, He aptly notes the 1845 building's "magnificent porch and tower" (the tower was not finished until 1855). While Wise lauds the building, he doesn't have much good to say of the Archbishop or Roman Catholic practice or doctrine (after all, this was written while the Edgardo Mortara kidnapping case was still fresh in memory). "Cross over to the southwestern corner of Eighth and Plum; there stands the archbishop’s cathedral with its magnificent porch and tower, protesting aloud, by the papal encyclical letters of syllabus and fifteen centuries of history, against the civil and religious liberty of the opposite side. “I alone can save you from the claws and paws of the devil and the terrible caldron of hell,” that cathedral maintains: ‘unless you go to heaven in my particular fashion, you can not go there at all. Unless you give the superintendency over state, school and society into the hands of the priest, and unless you believe and obey him, you are wicked and ungodly libertines and infidels, whom the Lord will punish in due time. Unless you do as I teach, you do that which is an abomination in the sight of the Lord, and destructive of the timely and eternal happiness of man.” There they stand slightly opposite one another, the cathedral and the city hall, kept apart by the atmosphere of liberty, steadily reminded by the stars and stripes waving from the roof of the latter, to keep the peace and to respect the personal rights of free-born man." Cincinnati, Ohio. Intersection of Eighth and Plum streets. We see the flank of the Plum Street temple and across the street the might tower of Saint Peter in Chains Cathedral, dedicated in 1845. Photo: Samuel Gruber 2017. Cincinnati, Ohio. Saint Peter in Chains Cathedral, dedicated in 1845. Henry Walter, architect. Photo: Samuel Gruber 2017. After describing The Plum Street Temple, Wise turns his eyes across Eighth Street to the new classical style domed Unitarian Church, another fine but demolished building. Built in 1864 by the Unitarians, it was apparently also known as the First Congregational Church. In 1887 the Unitarians moved to a new church at Reading Road. This structure was remodeled in 1888 for use by lawyers (it was directly across from City Hall) and became known as the Temple Court Building. The elegant building appears to have had its light-filled sanctuary on the second floor, much in the way many European synagogues were built. In fact, the main body of this building closely resembles many earlier American synagogues - such as the 1790s building of Beth Elohim in Charleston, and later synagogues, including classical style buildings in Cincinnati such as the former Adath Israel (now Southern Baptist Church). Significantly, however, when Rabbi Wise chose to build a notable new building for K. K. B'nai Yeshurun he chose the novel Moorish style rather the tried and true classicism of the Unitarians. Cincinnati, Ohio. Corner of Eighth and Plum Streets. Former Unitarian Church, later known as the Temple Court Building (demolished), built 1864. Historic photo. "Cross over more to the northeastern corner of Eighth and Plum and behold this neat structure surmounted with a mighty dome, to admit the sun’s pure rays of light, and to exclude the noise and confusion form the busy thoroughfare. It is the new and radical Unitarian Church, in which the Rev. Thomas Vickers will preach. This church stands nearer to the temple than to the cathedral; and in doctrine too, it approaches Judaism much closer than Roman Catholicism. This new church will call across the way to the temple, “I want none of your observances,” and to the cathedral, “I want none of your doctrines. I have carved out my own path of salvation, which you Christians call Deism and infidelity, and you Jews call a fashionable religion.” But there it stands on yonder corner, notwithstanding the arm of worldly power, inquisition, persecution, sword and pyre employed for centuries, to protect the church against such opposition. There it stands and exclaims with Teil: “Durch diese hohle Gasse muse er kommen” “He must pass through this hollow"
"Liberty’s mighty arm protects it. The consciousness of humanity salutes it as the sign of morning, dawning upon the horizon of the human family." 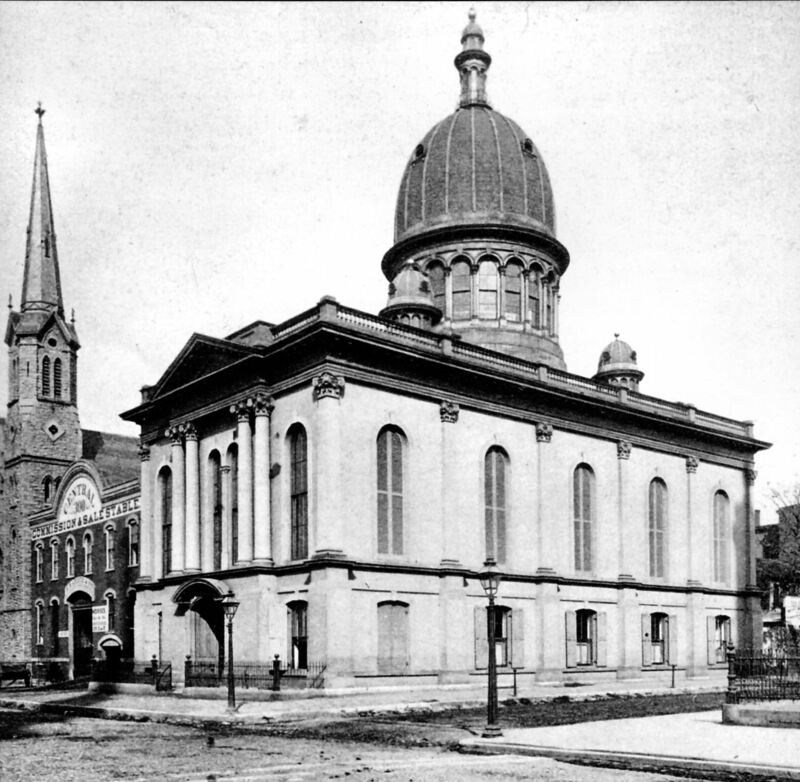 (visible in postcard views above), built according to one church list in 1867, and so almost exactly contemporary with the Plum Street Temple. Though the tall tower of this Romanesque-Gothic hybrid is gone and the ground floor entrance of the church facade has been changed, the structure survives and has been renovated for commercial use. The congregation was one of many that merged over the years - probably into what is now the Covenant - First Presbyterian Church just a block away, at 7th and Elm Street (see below). Towards Seventh Street, the lot adjacent to the Plum Street Temple was developed as a seven (?) story commercial building, probably around 1900. This space is now filled by a unsightly modern parking lot that nearly abuts the Temple and face the Catholic Cathedral. Cincinnati, Ohio. Plum Street and Temple and view of block from Eighth to Seventh Street. Historic photo. Cincinnati, Ohio. Plum Street and Temple and view of block from Eighth to Seventh Street as it is today..Photo: Samuel Gruber 2017. Cincinnati, Ohio. Plum Street Temple and adjacent parking garage. Henry Mosler would weep! Photo: Samuel Gruber 2017. Just beyond this tall stolid, but still attractive facade and across Seventh street was the Episcopal Cathedral of Saint Paul, built in a robust Romanesque style in 1852. Cincinnati, Ohio. Former Saint Paul Episcopal Cathedral, Seventh and Plum streets. Built 1852, demolished 1937. Historic postcard. There was still another church. By 1875 a large new Second Presbyterian Church was built behind the Plum Street temple, too. This still stands, now the Covenant - First Presbyterian Church facing Pliatt Park. For more than 75 years the church and the Temple almost bumped rear ends on Eighth Street - blocked only by a series of low-rise buildings. 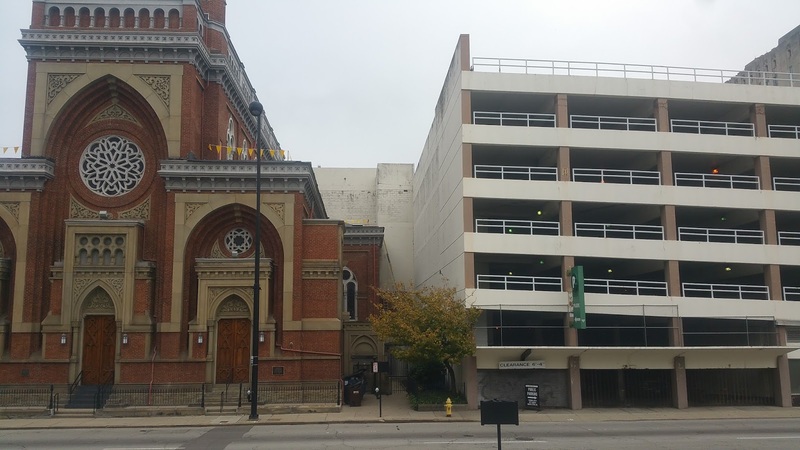 Now, sadly another big parking garage separates the two religious buildings. Cincinnati, Ohio. Covenant - First Presbyterian Church at Eighth and Elm Streets. Formerly Second Presbyterian Church, built 1875. Photo: Samuel Gruber 2017. Cincinnati, Ohio. Former Second Presbyterian Church and Plum Street Temple separated by low-rise buildings on Eighth Street. Detail from historic postcard. Cincinnati, Ohio. 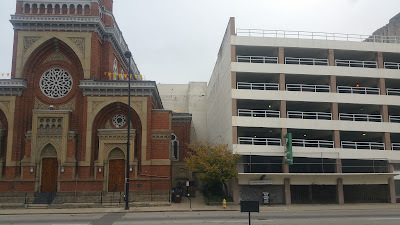 Former Second Presbyterian Church and Plum Street Temple separated by parking garage on Eighth Street. Photo: Samuel Gruber 2017. If the reader’s imagination is sufficiently vivacious, expansive and soaring to have a correct vision of said corner of Eighth and Plum Streets, he can form a correct and concrete idea of civil and religious liberty, for there is to be seen a picture to which the world at large can offer no parallel, no precedent, no comparison. On the north-western corner of Eight and Plum, in a neat little park with a foundation of water not quite crystal, there rises in Cincinnati gray, the City Building, in which the Judge of the Police court daily throws his terrible thunderbolts on the hands of the wicked; where sometimes you may find his honor the Mayor of Cincinnati or somebody to represent him; where the Board of Education fights the battles of the lord for or against the Archbishop of Cincinnati; where the Board of health feels quite well and healthy, notwithstanding the dead fish and the miserable meats sold in market; where above all our venerable city fathers meet in grand council, deal in Deer creek lots, give us a Garden of Eden, and make sometimes other sundry laws for other sundry purposes…. Concluding, Wise looks at all these fine buildings and sees the meaning of America - even if it may be a century or more before it is fully realized and these churches really do converse with each other - instead of shouting. The architecture takes us back to a very fervent and fertile time in American life, when our identity was still being shaped, even as it is again today. So it looks in Cincinnati, corner Eighth and Plum streets. It is the most striking monument of civil and religious liberty in this or any other country. It is the most telling demonstration of the spirit of our age and the freedom of our country. Job calls God, him “Who maketh peace in his heavens high.” Here god is revealed on earth in the same capacity. The head of the cathedral goes to the Ecumenical council in Rome. The head of the Presbyterian Church says, that man goes to worship the man of sin, the prince of darkness. The head of the Unitarian Church says, both of you worship Baal, each in his own bewildering dogmatism. The head of the temple thinks it will take them a century before they will be able to comprehend their errors, and one century longer to confess it. But over yonder the stars and strips command peace; peace in the name of the law, peace in the name of liberty, and all must submit. This is a wonderful corner. We wish to see one of the same kind in Rome, another in St. Petersburg, and again another in Constantinople. We do not mean to say, by any means, that we wish our city fathers and city officials to be in those distant cities, although we have no right to check their progress, if they should insist upon going there; we mean to say civil and religious liberty to all and every where.